If you’re visiting Northern or Central California, the little coastal village of Carmel-by-the-Sea and its immediate environs make for a lovely weekend break. Carmel has been called pretty, cute, charming, darling and adorable – any or all of these adjectives perfectly fit the bill for this picturesque little village! 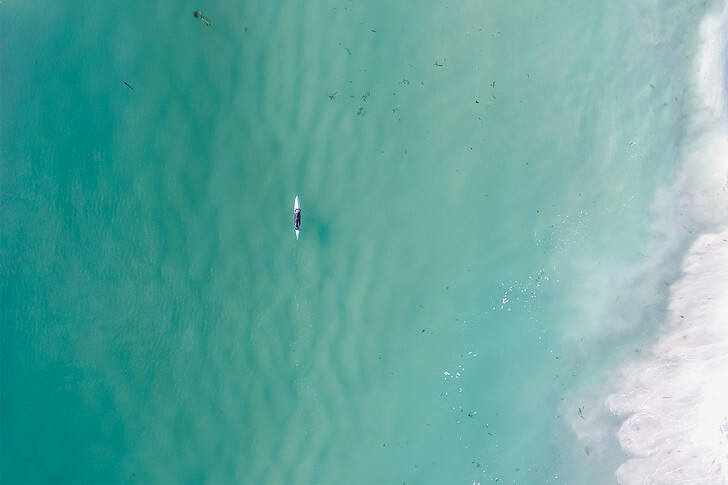 We asked California resident Dhara from Not About the Miles to share some local travel tips for visiting this coastal California gem. Read on to discover her Carmel travel advice and what fun things you can do in Carmel on a quick weekend trip! 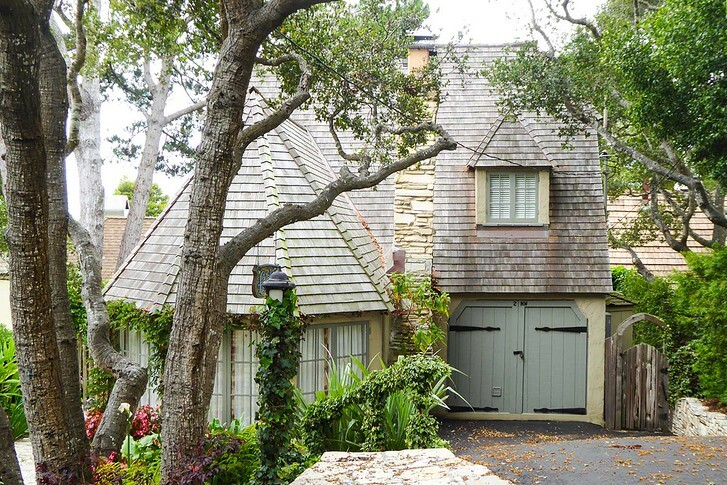 Carmel-by-the-Sea has a rich history. It was founded and incorporated in the early part of the 20th century. First inhabited by Native Americans, Carmel was colonized by the Spanish in the later half of the 18th century. When Mexico declared independence from Spain in the 1820s, Carmel became a territory of Mexico. In 1848, Carmel was ceded by Mexico to the United States of America, and became a part of the State of California. Did you know that the little village of Carmel has no street lights? And its homes and buildings have no numbers…how cute is that? If you look up Patiserrie Boissiere (and you should, for its delectable pastries! ), you’ll see the address listed as “Mission Street between Ocean and 7th.” No number! And Carmel residents go to the Post Office to collect their mail, because the mailman cannot deliver without a building number. L’Auberge Carmel – A Relais & Chateaux property, it’s comfortable, with a picturesque courtyard and turn-down service. The Carmel Mission Ranch | Right next to the historic Carmel Mission, this cute Carmel hotel offers a range of accommodations, including rooms designed for romantic getaways! Bernardus Lodge and Spa | If you really want to spoil yourself, and don’t mind driving a few miles out of the village, head to Carmel Valley where this stunning property, with lovely landscaping and luxurious accommodations, serves as a true wine country weekend retreat! 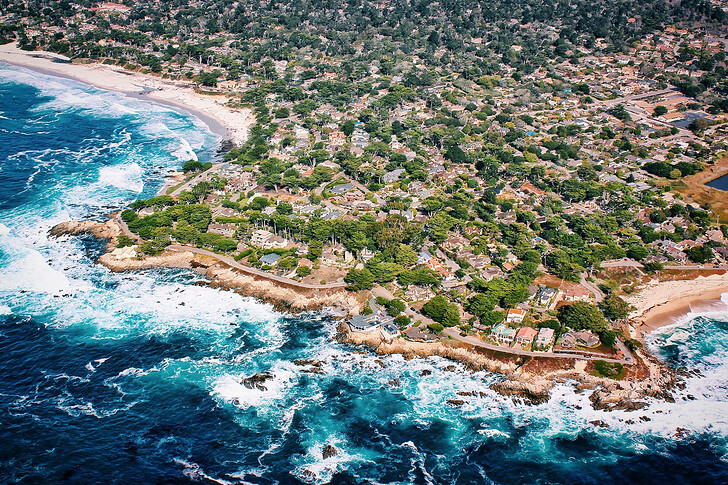 At just one square mile, Carmel-by-the-Sea is eminently walkable. Stop in at the Visitor Center on Ocean Avenue between Junipero and Mission and pick up brochures for self-guided walks, or opt for a guided tour by Carmel Walks. Admire the Spanish architecture, pose for photos against colorful tiles, peep into pretty gardens, and explore narrow walkways to lovely courtyards. Don’t miss the famous Hugh Comstock fairytale cottages, the first Murphy house built by Michael J. Murphy when he was just 17 years old, the Church of the Wayfarer (what a lovely name! ), the El Paseo Courtyard with tiles imported from Spain, and the Carmel fire station, built of Carmel stone. If you walk west on Ocean Avenue all the way down from the village, you’ll come to beautiful Carmel Beach. It’s a sandy beach, a rarity in California, and ideal for splashing in the waves (although the water is always too cold for me!) or walking along the water. When walking along the beach, don’t miss the majestic old Monterey cypresses: their trunks form stunning natural sculptures. Or the carpets of ice plant, with pretty pink or yellow flowers in season. Pick up a bottle of wine and some cheese in the village (we’ll tell you where! ), and settle in at a nice spot on the beach to enjoy the sunset! Of course, Carmel Beach is a lovely place to visit any time of the day, so if you can’t make it in the evening, go whenever you can during the day. There are organized volleyball games on weekends in good weather, so if you want to join in, dress appropriately! Note: Rogue waves and rip currents are always a possibility, so exercise caution. There are no lifeguards at this beach. 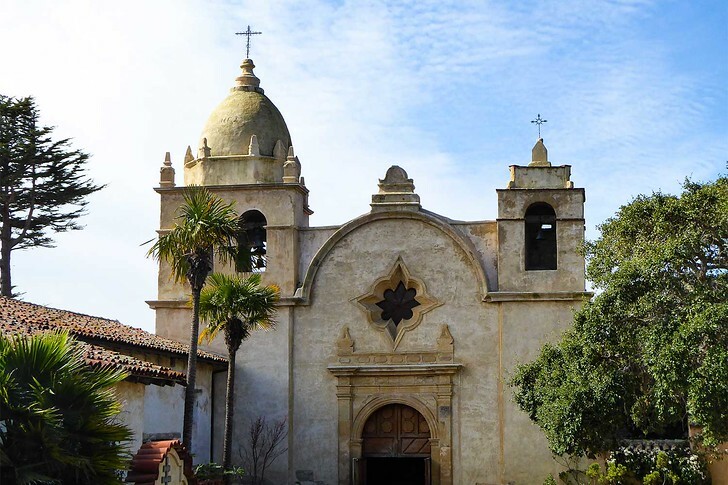 One of my travel goals is to visit all the 21 Spanish missions in California. I am about half way there, and the Carmel Mission is definitely one of my favorites. It was the second mission built by the Franciscan friars. Its formal name is Basilica of San Carlos Borromeo de Carmelo Mission, and it was founded by Father Junipero Serra in 1770. Father Serra is buried in the grounds of the Carmel Mission. The Mission still functions as a church. The Mission is a popular place for visitors at the weekends, but its gorgeous gardens and courtyards still offer peaceful places to relax, admire the Mission’s lovely facade, and just sit quietly and enjoy your surroundings. You can also visit the four museum galleries in the complex for insights into the history of the Mission and its restoration. Carmel Mission is one of the best preserved of the Spanish missions in California, definitely a must-visit during your weekend here. 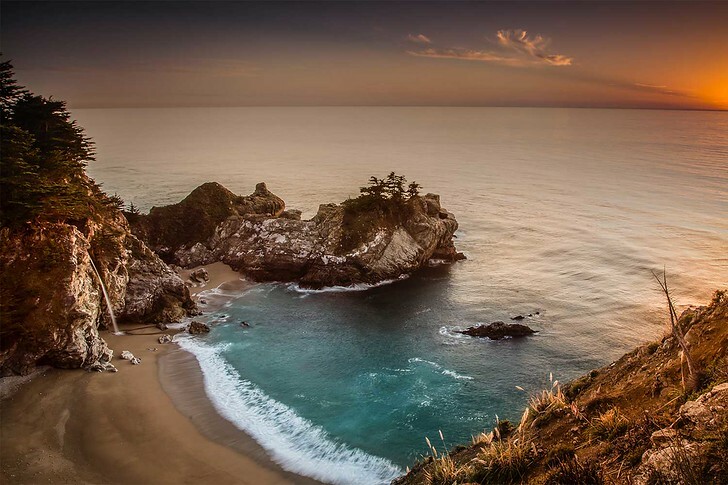 Just a ten-minute drive from Carmel-by-the-Sea is a stunning California State Park that you will definitely want to explore as part of your Carmel weekend getaway. So grab your hat and sunscreen and head out for some fun outdoors! Point Lobos has a network of trails, and many of them hug the beautiful coastline. None is super difficult or long, so you can pick one or two to get a taste of the natural beauty of the region. 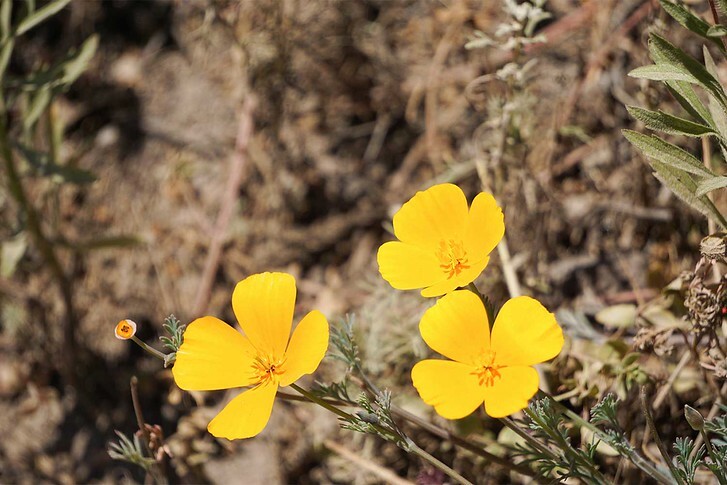 In the spring, you’ll see bright spots of color from wildflowers, including the cheery orange of the California poppy. 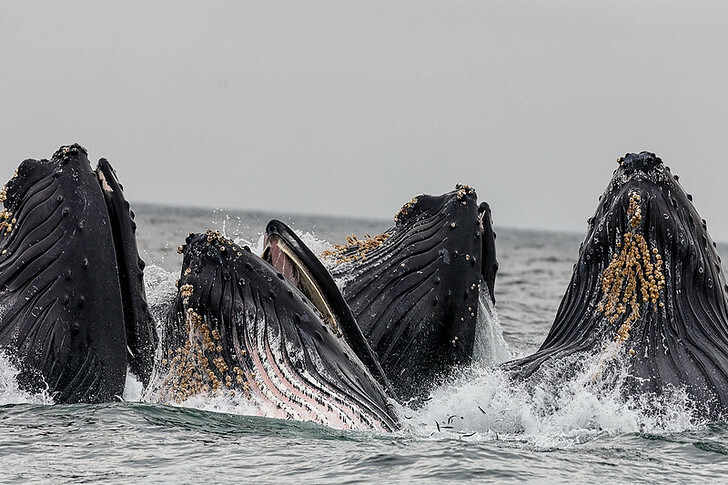 In season, you might spot whales spouting in the water as they head down to Baja Mexico for the winter or when they are on their way back to Alaska. Don’t miss the beautiful jade green China Cove and the ink blue Gibson Beach (on the South Shore Trail) and Bird Island, with its hundreds of sea birds, on the eponymous Bird Island Trail. 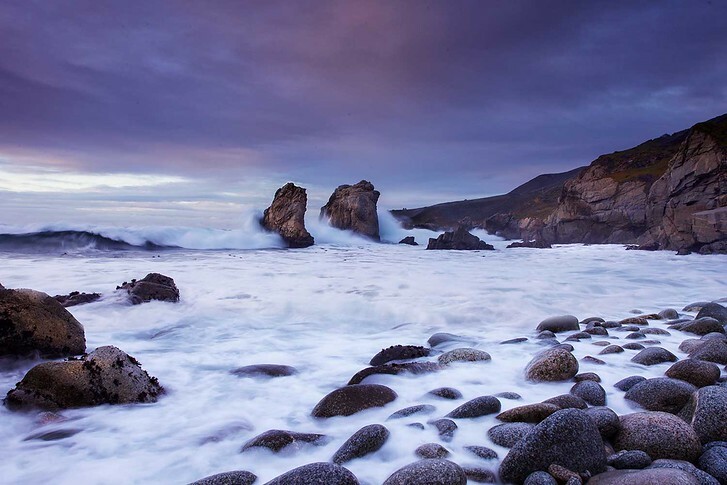 The Monterey Peninsula is an up-and-coming wine destination in California. There are numerous wine tasting rooms in the village, where you can sample some of the choice wines produced in the region. 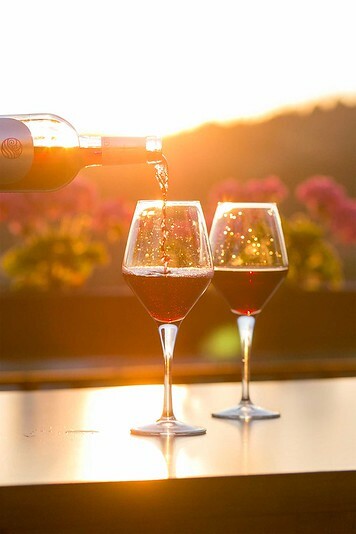 If you plan to do a lot of wine tasting, you might want to consider a Carmel Wine Walk-by-the-Sea Passport, a do-it-yourself tour of up to ten tasting rooms in the village. You can pick up the passport at the Visitor Center. At one of my favorites, The Cheese Shop, you can not only taste wonderful wines, both local and from all around the world, you can also sample delicious cheeses from many different parts of the world. They have a huge selection, every type of cheese you can imagine. You can pick up picnic fixings here to take to the beach or to Point Lobos, or even to your room for an evening treat. Another of my favorites is Trio Carmel, where you can taste premium wines, but you can also sample a wide variety of olive oil and balsamic vinegars. We never leave Trio without some bottles of their delicious trio of offerings! 6. Immerse Yourself in Art! For decades, Carmel has attracted artists, writers, and photographers, who found the village a beautiful place to exercise their creativity. Today’s resident creatives carry on Carmel’s legacy as an artist colony. There are close to 100 art galleries in Carmel’s one square mile. Isn’t that amazing? You’ll pass by them as you walk the town, but if you enjoy art, you should pop into a few and check out the exhibits. I love browsing the art galleries on a weekend afternoon. 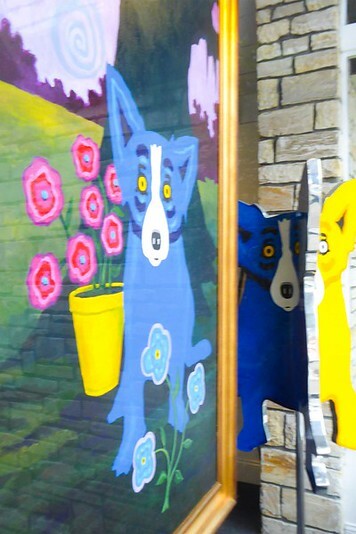 If you happen to be visiting on the second Saturday of the month, you can join the free Carmel Art Walk, a 3 hour tour of artist-owned galleries in the village. You can speak with the artists and view their creations. You can also choose a paid tour of art galleries or photo galleries by Carmel Art Tours. The Sunday Jazz Brunch at Carmel Mission Ranch is an event, and a fun thing to experience on your Carmel weekend getaway. The ranch has a fascinating history: it was at one point a creamery, then a private club, then an Officers’ Club for the Army and the Navy, and was about to be sold to become a condominium complex when Clint Eastwood bought it and had it restored into the beautiful property it is today. And the dessert station is simply scrumptious, with at least a dozen tasty treats you can try, including melt-in-your-mouth chocolate covered strawberries, a variety of light cakes, fresh fruit and flan. 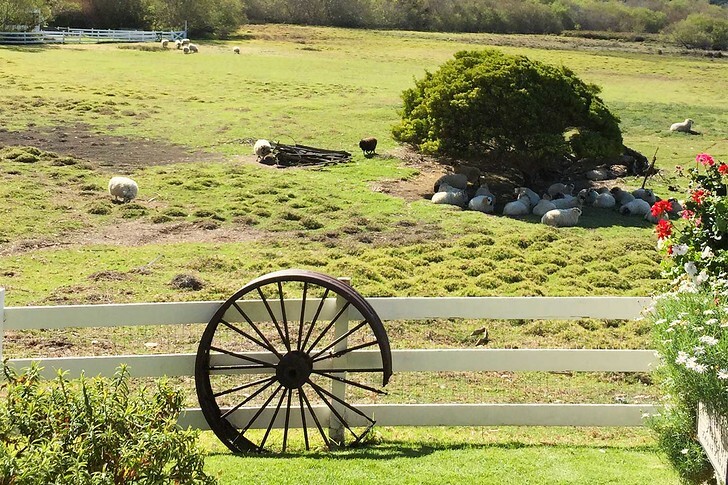 You can sit inside and enjoy the live music, or opt for the patio, with a bucolic view of sheep grazing at the ranch and the Pacific Ocean in the distance. If you are lucky, Clint Eastwood might pop in and make your day! You will need a car for the weekend. If you have the time, I suggest taking the coastal route (Highway 1) from San Francisco to Carmel. It’s a little over 120 miles of scenic road, and should take you about 2.5 hours without stops. From Los Angeles, you can drive to Carmel for the weekend, but it’s about 300 miles, so it will be a six-hour drive. You could also fly into San Jose and then drive down in just 90 minutes. Won’t have a car? Here are some options for guided tours to visit Carmel and nearby California attractions. Carmel is full of great restaurants, so no matter what cuisine you’re craving, you’ll find a place to suit your palate and your pocketbook. The best restaurants in Carmel? I love La Bicyclette, with its rustic ambiance and absolutely divine pizzas. Try the Andrew Molera, with local artichoke and Manchego cheese, or the Champignons, with oyster mushrooms and truffle oil…yum! Little Napoli, just across the street, is another of my favorites. Flavorful ingredients, including full-bodied fruity olive oil and rich Parmigiano-Reggiano, transport me to Italy. Dametra Cafe is affordable and very popular. It serves up Mediterranean favorites in a casual environment. There’s always a line to get into this place, so if you plan to go for dinner, make reservations. Carmel Bakery is a great place to stop for coffee and a pastry. For delicious desserts, head to Patisserie Boissiere. And for yummy gelato, stop in at Salumeria Luca, an Italian deli on Dolores Street. What’s at the top of your list of things to do on a Carmel weekend getaway?